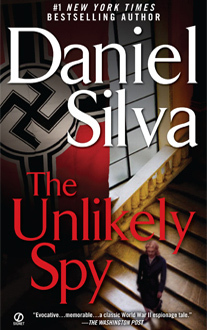 Daniel Siva’s debut novel, The Unlikely Spy, was first published in 1996.Because I so enjoyed two of his newer books, I thought I’d give this one a try. And I’m glad I did! This is the utterly compelling story of Britain’s MI-5 and Germany’s Abwehr, the military intelligence services, during World War II. Many German spies in Britain were arrested and either hanged or “turned” by MI-5. However, a number of agents were in the country in deep cover. The British suspected that those sleeper agents existed, but had no idea who they were. As the British and the Americans began planning for the Normandy invasion, they became concerned that knowledge of the date and location of the landing would end up in German hands. So began a massive, complex and, we know, successful plan to mislead the Germans. The Unlikely Spy is meticulously researched. Many of the characters are, of course, fiction. But there are realistic and compelling portraits of historical figures we know much about (Winston Churchill and Adolf Hitler, to name just two) and those most of us have never heard of. Chief among these is the head of the Abwehr, Admiral Wilhelm Canaris. Admiral Canaris was involved in a plot to depose Hitler and was actually executed by the Nazis for treason. This book can be very confusing with its tales of spies, military intelligence, and counter-intelligence. There are many characters, and it’s not always easy to figure out who is really working for who, and which of the characters is who they purport to be. The main character is Alfred Vicary, history professor at University College, London. Vicary is recruited for work at MI-5 by none other than Winston Churchill. He soon finds that he enjoys intelligence work, and is contributing to the war effort. In 1943 his boss, Brigadier Sir Basil Boothby, sets him to work on Operation Mulberry, Britain’s plan to deceive the Nazis. Vicary soon realizes there is much he is not being told about Mulberry, and also that he is being misled. Is Boothby a traitor? Or is he manipulating Vicary for other reasons? At the same time, there is much turmoil at the Abwehr. Germany is losing the war effort. They know that the Allies are planning an invasion of Europe, but they cannot figure out when and where the invasion will take place. The Abwehr activates one of its sleeper agents in Britain to ascertain this information. It is this person that Vicary is responsible for apprehending before it is too late. Kurt Vogel is the Abwehr administrator in charge of the sleeper agents, and he is no fan of Admiral Canaris. Vogel is ambitious, and willing to do anything to unseat Canaris and control the Abwehr himself. There is so much more to this book but it would be a disservice to write any more about it. It is thrilling, interesting, and will keep you guessing until the very end.